Caller ID *WITH NAME* came through today! When can MagicJack support Number Porting? [ Poll ] What MagicJack feature would you like to see added? CHAT SUPPORT WITH WEBCAM | Sheessh ..
A New Feature for VoiceMail? New Customer Dis-Service "is here"! 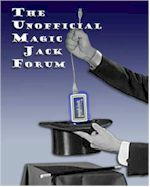 Transfer Your Phone Number to magicJack! Additional Customer Dis-Service Features made available. Can I keep my old home number and transfer it to majicjack? New Feature " Music On Hold"